The best Verbena we have ever seen in our trials. 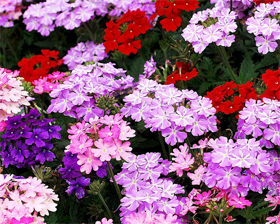 Dwarf, spreading, early blooming plants, producing vividly coloured flowers in a mix carefully formulated to maintain a range of bright colours in optimum balance. Invaluable for massing in beds, edges or borders, windowboxes and baskets. Flowers summer. Sow seeds in pots or trays of moist seed compost. Do not cover the seed. Place container in a propagator or warm place, and keep at a temperature of between 24-27C. Germination will usually take 14-21 days. Keep the compost on the dry side at all times, and water lightly as seedlings emerge. When large enough to handle, transplant seedlings into 7.5cm pots or trays.